It seems like it has been forever since I finished a quilt! It's good to finally check something off my Finish-a-long Quarter 3 list...yes, this is my first finish for the quarter that is ending in a couple of days. In my defense, I have made a skirt and a dress that weren't on the list, but it's still pretty sad that my list had three projects on it and I'm still only going to have one of them finished. At least it's a good one! My aim with the quilting was to keep it simple and not quilt it too much both for time and so the quilt would stay nice and soft. I quilted between the stars with a stipple with random wonky stars thrown in. I also outlined each star, and stippled around the smaller stars in the double friendship star blocks. I did all of the outlining with my free motion foot, which is much faster than with the walking foot, but it means the lines aren't perfectly straight. I'm okay with that, and I figure that the more I do it, the straighter they'll get. 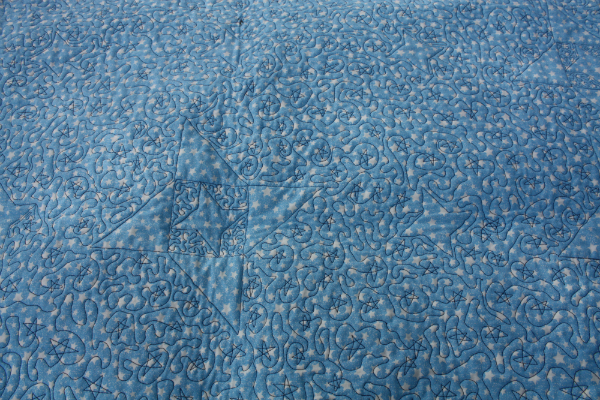 The quilting really shows up on the light blue star fabric I used for the backing. I learned something about myself with this quilt. Apparently I can't quilt something lightly. It took a lot of concentration to keep those stippling lines from becoming gradually closer together, and it was hard to convince myself that I didn't need to quilt something inside every one of the stars. I won that battle mostly because little Judah, who will be this quilt's owner, was born last week. Sometimes a quilt finished and gifted is better than a quilt still in progress! I wasn't really certain about the binding fabric at first. It seemed like the green was maybe a little overpowering, but I've decided that I quite like the way it frames the quilt. Plus, there's actually quite a lot of green in the stars and the rockets. This was my first time using a striped fabric for the binding and I really love the extra pizzazz it gives the edge of the quilt. I may have to start stocking up on stripes. 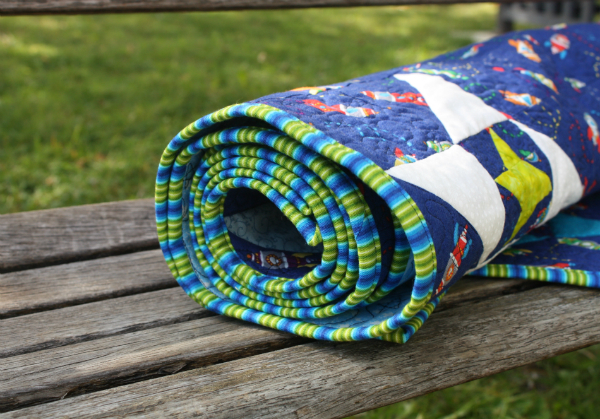 The pattern for this quilt, and three variations, is out with testers now. I'm looking forward to seeing what they make of it! Edited to say, the pattern is now available through my Etsy and Payhip shops. Yeah for a finish!! A finish out the door is better than a WIP. I love a striped binding and try to use it whenever possible. I have fabric for your pattern....hoping to get working on it this weekend. I'm excited! Congrats on your finish! I love the little rocket ship background that gives it an outer space feel . And I think the striped binding really does frame the quilt nicely. It looks great! I love that stripy binding. 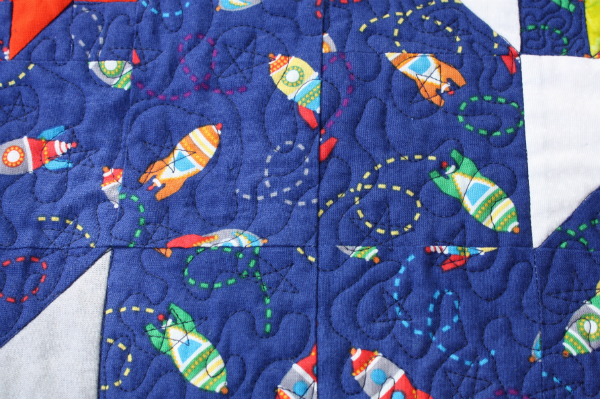 Love that rocket ship fabric. And the choice of quilting looks great. Awesome finish! Congratulations on a fabulous finish! The quilting is simply perfect. So suited to those Friendship Stars and star ships. And the binding is such a fun frame for this beauty! Well done Leanne. I love the binding fabric you used. 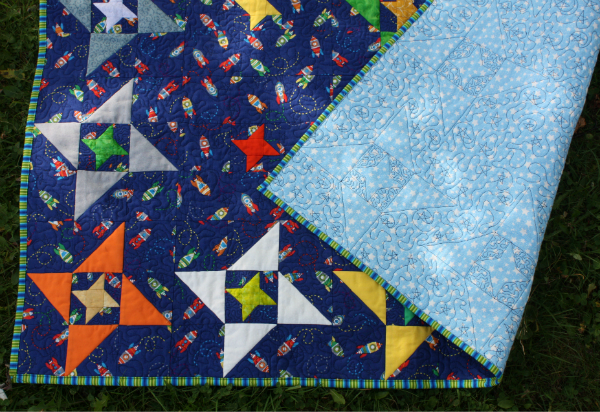 I do not find it overpowers the rest of the quilt, in contrary it lightens up the main blue. 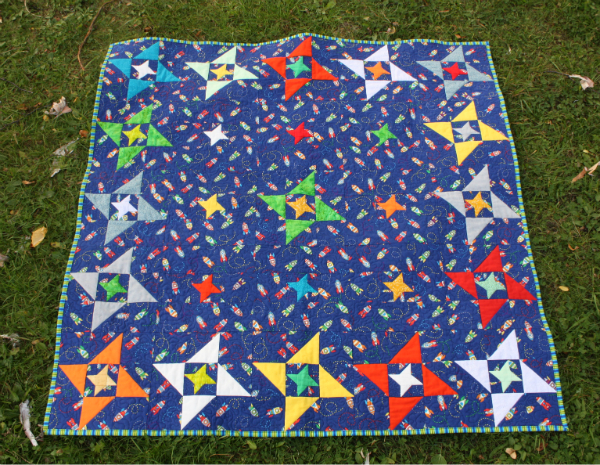 And the quilted stars are super cute!! What a wonderful and appropriate baby quilt. I love your quilting. Great pattern, too. Why don't you link it to Michelle's Let's Make Baby Quilts party tomorrow, Friday. Thanks for sharing. What a fun quilt. Love the bright stars and the green binding is a great frame. This is a great baby quilt! I love the stars-in-stars look. The binding frames your quilt perfectly. Love the bright happy colors you used. 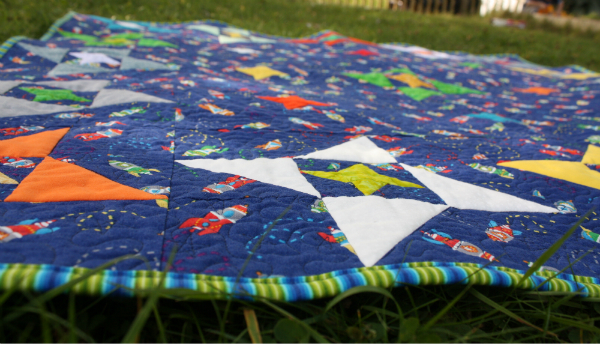 I love the different sized stars and the quilting you chose! Such a fun baby quilt! Oh I love this quilting!